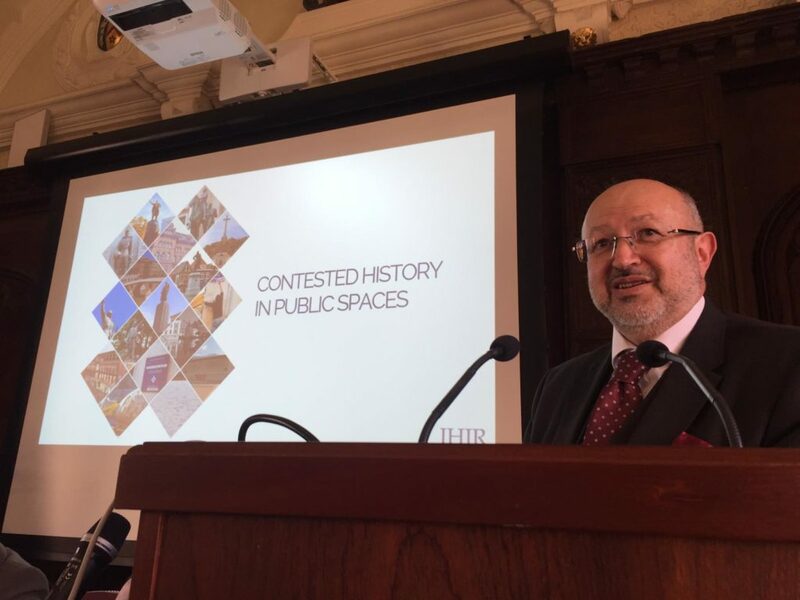 Motivated by a natural curiosity and well trained instincts, Lamberto Zannier, High Commissioner for National Minorities at the OSCE, attended the meeting organized around the project Contested Histories in Public Spaces in Oxford, which reviewed several cases of controversial monuments and statues around the world. In this meeting, Mr. Zannier explained the applicability of these cases as a reference point for developing conflict prevention tools and guidelines, where “education is key”, he stressed. Mr. Zannier addressing the Contested Histories in Public Spaces Task Force meeting at All Souls College, Oxford University. The charming streets of Oxford have some controversial corners. In the historical center of the city, right in front of the prestigious All Souls college, a statue of Cecil Rhodes stands undaunted, in spite of the campaign run by students asking to remove it and not further celebrate his legacy, polemically linked to Britain’s imperialism. Therefore, this city stands as a paradigmatic example of the global phenomenon studied by the Contested Histories in Public Spaces project, which Task Force meeting was held at the same All Souls college thus welcoming more than 20 scholars into a debate about the past and its day to day repercussions. This project, led by the institute for Historical Justice and Reconciliation (IHJR), in partnership with EUROCLIO and other organizations sharing similar missions, envisions a simple but rather ambitious goal: drawing useful guidelines and recommendations from the global phenomenon of contested statues, monuments and streets names, which are being challenged for their historical legacy, usually related to colonialism, slavery, human rights violations or fascism, among many others. From the Rhodes Must Fall movement in South Africa to the Captain Cook in Australia, from Holocaust memorials in Berlin to statues the Paraguayan dictator in Asunción, many are the cases found around the world -91 and summing up. Even though this project is still on a development phase, it has attracted interest amongst relevant actors, such as university authorities, parliamentarians, as well as members of the international community. For instance, the Organization for Security and Cooperation in Europe (OSCE), and its High Commissioner for National Minorities, Lamberto Zannier, who flew from The Hague to the UK to join the discussion. Lamberto Zannier, OSCE High Commissioner for National Minorities. But how comes that an organization dealing with security issues is interested in the public memory making through statues and monuments? Mr. Lamberto Zannier, in conversation with EUROCLIO, explained that his interest in this topic is tightly related to his mandate, which is primarily focused on conflict-prevention. “My mandate is to avoid or try to prevent tensions within society. Sometimes, I feel I need to dig a little bit more in-depth, and try to find out what is the source of these tensions. Very often this has to do with the interpretation of history”, he said. Awareness of this phenomenon, according to Mr. Zannier, did not come out of the blue. While traveling throughout the OSCE participating states -57 from Europe, Central Asia and North America- the High Commissioner has became aware of how salient this situation is for national communities. “The issue of memory politics is an issue that I keep finding as I travel through the area covered by my mandante. There are monuments, there are names of streets and symbols that I constantly find, where the interpretation by different groups differs and the difference of interpretation results in tension”, Mr. Zannier said, stressing that these dissimilar interpretations,combined with a lack of acknowledgment of the story of the Other, “affect the relationship between groups in society”. That is how the High Commissioner for National Minorities of the OSCE became interested in looking how issues of this kind have been addressed in different contexts, and what are the lessons that can be retrieved from other cases around the world. In this regard, the mandate of the High Commissioner is matching with the project of Contested Histories in Public Spaces, which aim is to identify and research the decision-making process behind sometimes violent controversies over statues, monuments, and street names. What can a major of a city do when a statue is painted in red? What can a dean of a university do when the name of a hall is covered with pamphlets and banners? What can an activist ask for when a street name is considered offensive? Through practical guidance, the Contested Histories in Public Spaces project is aiming at addressing these questions in order to help future decision-makers and grassroots organizations. “My job is to advise governments, and put forward an advice that is not only my own personal opinion, but that is based on things that worked before or against processes that resulted in failure. Look! Somebody else has tried this, and it was a disaster, so think twice before you do it, because you might apparently solve the problem tomorrow but then, the day after, you start finding out that you have a larger problem within your society”, said Mr. Zannier, explaining why he has decided to join the working group of this project. “I am exploring, and I do realize that this is a very sensitive issue”. Since its foundation in 1992, EUROCLIO has been raising awareness about the uses (and misuses) of history education for paving the way to a peaceful future. Even though the study of history is usually confined to academia, the role that it plays in the issues our societies are wrestling with today is rather prominent, especially for the emancipation of minority groups and social cohesion. This situation is also clear for Mr. Zannier, who believes that younger generations are the key for conflict prevention. “If you want to have an integrated society you need to work on the young generations to make sure that people grow inside the society, and the diversity becomes well embedded in the society”, he said. Mr. Zannier also underlined the benefits of a well achieved integration, by which diversity can be at the service of society instead of being a problem. “You can free the government of the problem of dealing with diversity if you put this diversity at the service of the country. Then you really make the society more resilient to potential instabilities”. Together with his interest to explore issues around history education, the attention paid by Lamberto Zannier to the role of history and memory in conflicts, represents a milestone for the international community. EUROCLIO and the IHJR welcome and appreciate his willingness to address such as sensitive but important topic, and believe that his path should be followed by other key decision makers.